We’ve made t-shirts to Free Ai Weiwei. For us this shirts had to be made in China. Corresponding with over 50 Chinese factories through alibaba.com resulted in an interesting research we’ve put together in a small booklet, and sold it together with the shirts. On april 3th, 2011 the Chinese artist/activist Ai Weiwei was arrested. In reaction on his captivity Coralie Vogelaar and I started this project. In China it seems impossible to express criticism on the government. Censorship is standard. Next to this China is an economic world power and the working place of the world. A super-capitalistic system within a socialistic structure. Does this work? 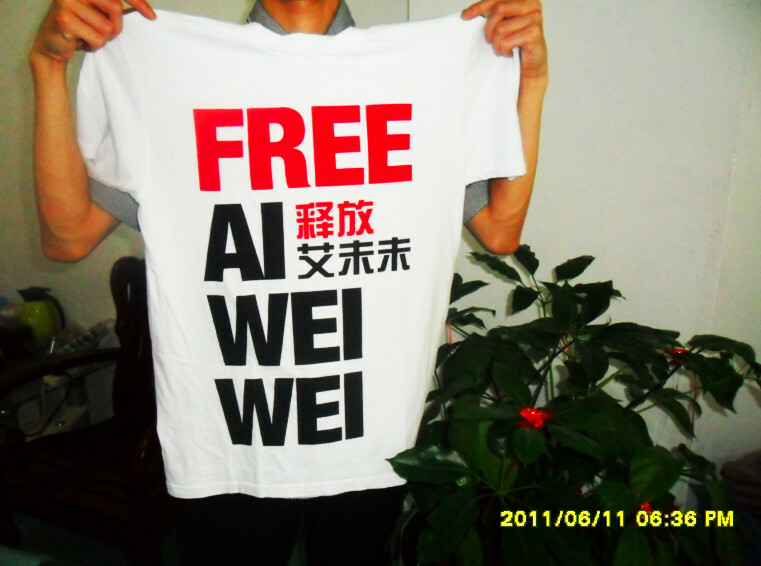 For example, is it possible to get a shirt that says ‘Free Ai Weiwei’ produced in China? And can you get it through customs? How far goes the censorship in China? Does it maybe end within the international trade?